John W. Farley is a professor in the department of physics and astronomy at the University of Nevada, Las Vegas, where he has won several awards for distinguished teaching. His scientific research interests include materials science and corrosion. His political writings have appeared on the CounterPunch Web site. Most climate scientists believe that the human contribution to today’s global warming is important, and cannot by any means be dismissed as negligible. The consequences of global warming are potentially very dangerous. In view of the importance of the issue, and in view of Cockburn’s prominent (and well-deserved) role as a left intellectual and his formidable powers of persuasion, it is worthwhile restating the scientific case for modern anthropogenic global warming. The present article consists of (1) a summary of the scientific case for modern anthropogenic global warming, (2) a summary of the contrarian case advanced by Cockburn, (3) an assessment of global warming in greater depth, and (4) my detailed critique of the contrarian arguments advanced by Cockburn. The scientific case is not dependent on citation of authority, no matter how distinguished the authority may be. The case is dependent upon experimental evidence, logic, and reason. The present article does not touch on the impact of global warming, or on policy questions: what to do about global warming, whether the Kyoto treaty is a good idea or not, etc. When sunlight strikes the earth, infrared radiation is emitted by the earth. Greenhouse gases in the atmosphere absorb this radiation, which results in a warming of the earth. The greenhouse effect is a very large effect: without greenhouse gases in the atmosphere, the earth’s surface would likely be below the freezing point of water. Carbon dioxide (CO2) in the atmosphere has been increasing since the Industrial Revolution began, due primarily to the burning of fossil fuels and to deforestation. This increase in greenhouse gases causes an enhanced greenhouse effect, which warms the earth. A straightforward calculation reveals that when the CO2 in the atmosphere reaches twice the pre-industrial level, the enhanced greenhouse effect alone (i.e., neglecting any response by the earth to the enhanced greenhouse effect) will warm the earth by 1.2 to 1.3˚C. There is no significant controversy among scientists about this part of global warming. The earth will in fact respond to the increased temperature. This is called “feedback.” There is controversy about the magnitude of the feedback. Analysis that takes feedback into account predicts global warming in the range of 1.5 to 4.5˚C (as indicated by the Intergovernmental Panel on Climate Change [IPCC]). Controversies among climate scientists concern the magnitude of the warming, not whether or not it is occurring. Climate is controlled by a number of factors, including changes in the earth’s orbit, possibly solar variability, possibly volcanoes, and the greenhouse effect. All but the last factor are entirely natural. Human activities are not the only contribution to the greenhouse effect. Until the last two centuries, humanity had a negligible effect on climate, and all climate change was naturally occurring. Some climate changes in the distant past have been very large (e.g., ice ages) and were not caused by humans. None of these statements refute the proposition that human activities (particularly burning fossil fuels) are an important contribution to the global warming that is occurring right now. During the Great Depression of the 1930s, the burning of fossil fuels plunged by 30 percent, but the concentration of CO2 in the atmosphere did not decrease. Therefore, he contends, increased atmospheric CO2 does not come from the burning of fossil fuels. Water vapor, not CO2, is the main greenhouse gas, and the portion of global warming attributable to CO2 is therefore tiny. When the earth emerged from the most recent ice age some 10,000 years ago, the global temperature and the concentration of atmospheric CO2 both rose, but the temperature rise preceded a rise in atmospheric CO2. Therefore it was the warming that caused the rise in CO2 and not vice-versa. The warming was caused by a Milankovitch cycle, a small change in the earth’s motion. The increasing concentration of CO2 in the atmosphere is caused by CO2 coming out of the oceans, not by the burning of fossil fuels. Hence the increase in atmospheric CO2 is natural, not anthropogenic. The residence time of CO2 in the atmosphere is only a year or two before it dissolves in the ocean. This turns out to be important in supporting point 4 above. The forecasts of anthropogenic global warming are entirely dependent on the results of large-scale computer models, which can be easily manipulated by the computer modelers to get any result they want by tweaking the variables in the computer models. Based on these scientific arguments, Cockburn goes on to argue that the computer modelers proclaim their unjustified doomsday forecasts in order to keep their grant funds flowing. He also argues that the nuclear power industry is supporting global warming hysteria in order to promote nuclear power. The greenhouse effect warms the earth. The warming power of the sun is mostly in the visible and ultraviolet region of the spectrum. The surface of the earth re-radiates solar energy back toward space in the form of infrared light. Because of greenhouse gases in it, the atmosphere is transparent to the visible light coming from the sun, but opaque at many wavelengths in the infrared band, resulting in the trapping of thermal energy and the warming of the earth. This is the so-called greenhouse effect, which has been known for two centuries.4 The first scientist to realize that the atmosphere warms the earth may have been the French mathematician and physicist Joseph Fourier in the 1820s (who should not be confused with the journalist and utopian socialist Charles Fourier). The primary greenhouse gases are water vapor, CO2, and methane (natural gas, CH4). I don’t know any scientist who doubts that the greenhouse effect is a real effect. The actual observed average surface temperature of the earth is 15˚C (59˚F). Thus the greenhouse effect raises the earth’s surface temperature by 33˚C (60˚F). In this sense, global warming has already happened! Not only is the greenhouse effect a real effect, it is a large effect. The greenhouse effect is intensifying as a result of the greenhouse gases building up in the atmosphere due primarily to CO2 from the burning of fossil fuels (coal, oil, and natural gas) and deforestation. Accurate data by direct experimental measurement was not available until 1959, when the geochemist C. D. Keeling started taking data at Mauna Loa, Hawaii. That measurement program has continued up to the present.6 Chart 1 shows the data from 1959 to the present. The data show a seasonal cycle that matches the growing season in the Northern Hemisphere, with a maximum in May and a minimum in October.7 Most significant is a long-term upward trend: from 315 ppm in 1958 to 387 ppm in 2008. While other aspects of global warming have been controversial, nobody has ever doubted the data from this measurement program. The data are rock solid. Several research teams have measured the atmospheric CO2 concentrations and the data from the different researchers are in agreement. Although the earliest data from direct measurement of CO2 in the atmosphere are from 1958, it is possible to extend the data earlier by examining air bubbles trapped in ice in Antarctica and Greenland. Data on the long-term CO2 trend show that the CO2 level remained stable around 280 ppm during the last 10,000 years.8 Then CO2 began to rise around the time of the Industrial Revolution, and is now 38 percent higher than pre-industrial levels. Climate scientists attribute the pre-industrial level of CO2 (280 ppm) to natural causes, and the rise since then to human activity, primarily due to the aforementioned causes. The question naturally arises, what will be the effect of increased greenhouse gases? Since the greenhouse effect is a real effect, it is hard to avoid the conclusion that the buildup of greenhouse gases will result in an intensified greenhouse effect, resulting in increased global warming to some extent. In other words, the argument is over the amount of increased global warming, not over whether or not it is occurring. The amount of increased global warming might be small or large, but it is a real effect. The important scientific question is whether or not increased global warming will be large enough to cause a problem. To answer this question, we need to understand in more detail how greenhouse gases absorb light in the infrared band. Different gases absorb light of different wavelengths. Measurements from outside the earth’s atmosphere by a satellite show that CO2 has a particularly strong absorption of light around wavelengths of 15 micrometers.9 Gavin Schmidt in 2005, following work done by Ramanathan and Coakley in 1978, calculated the effect of greenhouse gases in the following way: If you remove one gas from the atmosphere, while keeping all the other gases constant, what is the resulting percentage change in the infrared power that is absorbed by the atmosphere?10 Schmidt obtained the following numbers, shown in table 1. The data in table 1 were computed by assuming that one gas is removed from the atmosphere, leaving everything else unchanged. But since there is overlapping infrared absorption, the absorption from one species will interact with the absorption from another species. Some wavelengths of infrared light are absorbed by both water vapor and CO2. At these overlapping regions, if you remove water vapor alone (leaving the CO2), the CO2 will absorb the infrared light, while if you remove CO2 from the atmosphere (leaving the water vapor), the water vapor will absorb the infrared light. Thus the absorption by one species depends on what other species are present in the atmosphere. 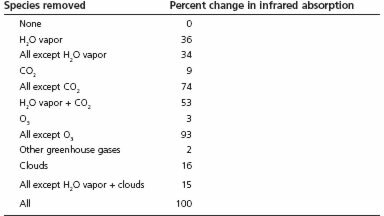 This accounts for the otherwise puzzling fact that the numbers do not add up linearly: If you remove all water vapor from the atmosphere, the infrared absorption will decrease by 36 percent. If you remove all greenhouse gases (and clouds) and leave only water vapor, the infrared absorption will decrease by 34 percent. The two do not add up to 100 percent, because of overlaps. All this is valuable background for the crucial question: How important is CO2 in the greenhouse effect? If you remove all the CO2 from the atmosphere, the infrared absorption decreases by 9 percent. If you remove all the greenhouse gases (including clouds) from the atmosphere except CO2, the absorption decreases by 74 percent, meaning that 26 percent (= 100 percent – 74 percent) of the absorption is still present if CO2 were the only greenhouse gas in the atmosphere. So the effect of CO2 can be either 9 percent or 26 percent of the greenhouse effect, depending on how it is defined. Undoubtedly the different definitions account, in part, for the different values cited in the literature for the importance of CO2 in the greenhouse effect. But whether it is 9 percent or 26 percent, the effect of CO2 is not a negligible effect. For water vapor, the table above gives two numbers: 36 percent and 66 percent (= 100 – 34), depending on the definition. From the table above, the water vapor contribution to the greenhouse effect is 36 to 66 percent, while the contribution of CO2 is 9 to 26 percent, depending on the definition. Taking the first numbers, water vapor is more important by a factor of 36/9 = 4.0, and taking the second numbers, water vapor is more important by a factor of 66/26 = 2.5. Note that water vapor is somewhat more important than CO2, but CO2 is by no means negligible. Let’s ask what the result would be if the greenhouse gases in the atmosphere were to double? A naïve (and incorrect) calculation would be the following: Since the existing level of greenhouse gases resulted in a temperature increase of 33˚C (60˚F) compared to a hypothetical earth without greenhouse gases, then doubling of all the greenhouse gases would result in an additional increase of 33˚C (60˚F), giving an average surface temperature of the earth of 48˚C (119˚F). Fortunately, this frightening result stems from a misunderstanding of how greenhouse gases retain heat. The prediction of the IPCC is that doubling the level of CO2 will result in a temperature increase of a few degrees Celsius. It is at first glance surprising and welcome that the forecasted effects of global warming are smaller than this naïve calculation would expect. This naïve calculation is incorrect for two reasons. First, the effect of saturation. The atmosphere is already opaque in parts of the infrared spectrum. Increasing the level of greenhouse gases will not make any difference at those parts of the spectrum. If the absorption at a certain wavelength is close to 100 percent, doubling the CO2 level will not double the greenhouse effect. For example, suppose that at a certain wavelength, 90 percent of the infrared light from the earth is absorbed by CO2 in today’s atmosphere. If the concentration of CO2 in the atmosphere were doubled, the absorption cannot go to 180 percent, which is an impossibility, but will go instead to nearly 100 percent. Second, the effect of spectral overlap. The absorption of infrared light by water vapor has areas of overlap with the absorption by CO2. In regions where infrared light is already strongly absorbed by water vapor, changing the concentration of CO2 will make little or no difference. These two effects (saturation and spectral overlap) explain why naïvely adding the effects of greenhouse gases is not correct, and overestimates the effect of increased greenhouse gases on the transmission of the atmosphere. An increasing concentration of CO2 will have little effect at the center of a strong absorption peak, because the atmosphere is opaque there already. Instead, an increasing concentration of CO2 will have its largest effect on the wings of a strong peak. The atmosphere is opaque in some parts of the infrared, with “windows” where the atmosphere is transparent or partially transparent. The effect of increasing concentrations of CO2 is to close the windows. Although this naïve calculation is mistaken, it illustrates an important point. People are often surprised at the thought that CO2, present in the atmosphere at only a few hundred parts per million, can result in a large enough change in the earth’s average temperature to make a difference. Instead, the real surprise is that global warming is as small as it is. Climate scientists separate the climate problem into two parts: climate forcing and climate response. The forcing includes possible changes in the brightness of the sun, or changes in the greenhouse effect.11 The climate response is a resulting change in the equilibrium temperature. The climate sensitivity is the change in temperature divided by the climate forcing. A very simple calculation from a standard textbook shows that (if you make the assumption that nothing else in the system changes) a doubling of CO2 from the pre-industrial levels is estimated12 to produce a temperature rise of about 1.2 to 1.3˚C (2.2 to 2.3˚F). The calculation is straightforward enough that there is little controversy in the scientific community about it. The logic is hard to dispute: the greenhouse effect is a real effect, the burning of fossil fuels leads to increasing concentrations of CO2, producing an enhanced greenhouse effect. The resulting temperature rise, if you assume that nothing else changes in the meantime, is only 1.2 to 1.3˚C. If the feedback is positive, then changes in the earth will enhance the change in temperature, and global warming arising from a doubling of pre-industrial CO2 will be more than 1.2 to 1.3˚C. If the feedback is negative, then changes in the earth will counteract the change in temperature, and global warming from a doubling of pre-industrial CO2 will be less than that. If the feedback is positive, then temperature change feeds on itself. If the feedback is negative, then temperature change will be self-limiting. If the feedback is positive, it does not imply that temperature changes would feed upon themselves forever. An enhanced greenhouse effect causes a rise in the average temperature of the earth, which in turn will increase the power radiated by the earth, as given by the Stefan-Boltzmann law. The average temperature of the earth will rise from the present value to a new, higher average temperature, “glowing” more brightly and re-radiating more energy into space until a new equilibrium is reached. Global warming is about the shift in the equilibrium temperature, arising from the enhanced greenhouse effect. The estimate of the IPCC is that doubling the concentration of CO2 in the atmosphere will lead to an increase of 1.5 to 4.5˚C (2.7 to 8.1˚F). The predicted temperatures consist of 1.2 to 1.3˚C from the enhanced greenhouse effect that is multiplied by an “amplification factor” arising from positive feedback. The calculated amplification factor is in the range from 1.2 to 3.75. If the amplification factor is 1.2, then the temperature will be 20 percent higher than it would be in the absence of feedback, while if the amplification factor is 3.75, the temperature rise will be nearly quadruple what it would be in the absence of feedback. The controversy is all about the feedback. That’s what the climate scientists are arguing about: How much is the feedback? Two important examples of positive feedback are the ice-albedo effect and water vapor. The ice-albedo effect: If the temperature increases, ice and snow melt near the poles, replacing white snow with dark earth. Since snow reflects sunlight while earth absorbs sunlight, this decreases the reflectance (“albedo”) of the earth. Decreased reflectance means that a larger fraction of the sunlight falling on the earth is absorbed. This in turn leads to further warming. Thus a small warming leads to larger warming. The ice-albedo effect can also work in reverse: A small decrease in temperature will lead to increased snow cover, resulting in higher albedo, meaning that more of the sunlight falling on the earth is reflected and less is absorbed. Thus a small cooling leads to a larger cooling. Water vapor: Warmer air can hold more water vapor than cooler air. The so-called saturation vapor pressure of water rises with temperature. Thus, a small temperature rise can lead to an increased water vapor concentration, which in turn results in an enhanced greenhouse effect, and more warming. If the temperature decreases from 15˚C by 1˚C, the equilibrium vapor pressure of water decreases by 6 percent, while if the temperature increases by 1˚C, the equilibrium vapor pressure increases by 7 percent. This is quite significant given the importance of water vapor as a greenhouse gas. It is helpful to clarify an important point: Climate scientists believe that water vapor is a feedback, not a forcing. If you somehow removed all the water vapor from the atmosphere, it would restore itself in a matter of weeks. After all, most of the surface of the earth is covered by water. Change in the water vapor in the air is one of the ways that the earth reacts to external forcings. And it’s a positive feedback. In addition to positive feedback mechanisms, there are possible negative feedback mechanisms. For example, if increased temperatures cause more clouds, and if clouds have a net cooling effect (this is uncertain), then this would constitute a negative feedback mechanism. Another suggested negative feedback mechanism was the “adaptive iris” proposed by MIT professor Richard Lindzen in the early 1980s. Lindzen proposed that increased sea-surface temperatures in the tropics lead to decreased cirrus cloud formation, leading in turn to increased “leakage” of infrared radiation, which amounts to a decreased greenhouse effect. The upshot is negative feedback. Lindzen, a global warming skeptic, agrees that increased atmospheric CO2 leads to an enhanced greenhouse effect, but does not believe that feedback is positive. The full complexity of modern climate science arises in attempting to grapple with the feedback. The number of possible feedbacks is quite complex.13 The crucial question is the sign and magnitude of the feedback. In view of the complexity of the system, it may very well not be possible to determine from first principles whether the feedback is positive or negative. However, there are other pieces of evidence that support positive feedback. In analyzing the past temperature record, the temperature changes are larger than would be expected if there were no feedback. This will be pointed out in several sections below. If you look at the temperature record for a long span of time, you find that there have been changes in the temperature in the past, including big changes. During the Cretaceous Period 100 million years ago, the global mean surface temperature may have been as much as 6–8˚C (11–14˚F) higher than today. Obviously these temperature changes in the distant past had nothing to do with human activities, because there were no humans back then. Climate scientists do not contend that climate changes in the past were due to humans. They do maintain that the global warming we are experiencing now is at least partially due to human activities. In the past million years, the earth has undergone ten major and forty minor episodes of glaciation. The triggers for these events are believed to be changes in the motion of the earth, first investigated by Milutin Milanković in the 1920s. Specifically, the tilt of the axis goes from 22 degrees to 24.5 degrees and back again every 41,000 years. The month when the earth is closest to the sun varies in cycles of 19,000 years and 24,000 years. The shape of the orbit is observed to vary from elliptical to nearly circular, with a period of 100,000 years. These slow variations arise from the gravitational forces and torques exerted on the earth by the other planets (especially Jupiter and Saturn), the sun, and the moon. In addition to Milankovitch cycles and the enhanced greenhouse effect, another possible cause of climate change is solar variability. Since 1979, spacecraft-borne instruments have recorded variations in the sun’s output, on time scales ranging from minutes to decades. The largest short-term dips of 0.3 percent last about a month, and are associated with sunspots that are carried across the face of the sun. (The sun’s rotation rate has a period of twenty-seven days.) The eleven-year sunspot cycle is associated with changes in the sun’s output of about 0.1 percent. There are no precise measurements of the solar output before 1979, and no direct measurements at all before about 1900. Instead, climate scientists rely on proxy indicators of solar activity, isotopes in cosmic rays, carbon-14 (14C) and beryllium-10 (10Be), which are found in tree rings and ice deposits, respectively. This record stretches back thousands of years. The sun may make a contribution to climate change, at least in the period before 1800. Lean and Rind believe that in the period 1600–1800, the reconstructed solar radiation (from proxy indicators 14C and 10Be) correlates well with the surface temperature of the Northern Hemisphere. If you use that period to compute a climate sensitivity, you get an increase in solar radiation of 0.14 percent, which is too small by a factor of two to account for the observed temperature rise of 0.28˚C, in the absence of positive feedback. If the modest climate changes in the period 1600–1800 are attributed to solar variations, then this is another argument in favor of positive feedback. Contrarian Claim 1: The Great Depression Argument. Alexander Cockburn argues that during the Great Depression of the 1930s, worldwide anthropogenic production of CO2 fell by 30 percent, but the concentration of atmospheric CO2 didn’t fall by even one part per million, at a time when the atmospheric concentration was just over 300 ppm. Cockburn’s data indicate that worldwide annual CO2 production from fossil fuel plunged 30 percent, from 1.17 gigatons (Gt [1 Gt = 1012 kilograms, i.e., a billion metric tons]) in 1929 to 0.88 Gt in 1932, but the CO2 concentration did not fall by even 1 ppm. Cockburn cites the following figures: 306 ppm in 1928 and 1929, and 307 in 1932. Cockburn proclaimed that “a whopping 30 percent cut in man-made CO2 emissions didn’t even cause a 1 ppm drop in the atmosphere’s CO2. Thus it is impossible to assert that the increase in atmospheric CO2 stems from human burning of fossil fuels.”17 Cockburn does not specify how large an effect on the CO2 mixing ratio he expects to see, but clearly, in his mind, there ought to be a drop of at least 1 ppm, if anthropogenic CO2 were a significant contributor to the atmospheric CO2. Let’s calculate how large an effect should be expected, using Cockburn’s numbers. First, let’s distinguish between a reservoir of carbon and a flux of carbon. The atmosphere is a reservoir holding a certain amount of carbon, while the annual production of CO2 is a flux, transferring a certain amount of carbon to the atmosphere every year. The reservoir of carbon (as CO2) in the atmosphere is proportional to the concentration (expressed as parts per million), measured by the Mauna Loa observatory. The flux from burning fossil fuel (and other anthropogenic sources) is a certain amount of CO2 injected into the atmosphere every year. The pre-industrial level of CO2 in the atmosphere was about 280 ppm. As a result of the industrial revolution, the level crept up to just over 300 ppm by the onset of the Great Depression. The increase of 20 ppm (= 300 – 280) was primarily due to the accumulated emissions from fossil fuels since the beginning of the Industrial Revolution. If the Great Depression had cut the burning of fossil fuels to zero, the result would have been the gradual decrease (over a long period) from 300 ppm back down to the pre-industrial level of 280 ppm. Nobody should expect a 30 percent decrease in the 300 ppm level of atmospheric CO2, because 280 ppm is natural. Instead you expect a 30 percent decrease in the rate at which CO2 is increasing in the atmosphere. In more detail: Even after cutting back the burning of fossil fuels in the Great Depression, the fluxes were still unbalanced, and atmospheric CO2 continued to increase. In the 1995 IPCC report, which covers the 1980s, the following numbers reveal the reservoir and fluxes to and from the atmosphere. The reservoir of carbon in the atmosphere was 750 Gt in the 1980s—this is the total mass of all carbon in the atmosphere. The atmospheric concentration was about 340 ppm. From these numbers, we can calculate that back in the early 1930s, when the atmospheric concentration was 300 ppm—i.e., 88 percent (300/340 x 100) of the value in the 1980s—the atmospheric reservoir was about 662 Gt., i.e., 88 percent of the value in the 1980s (662 = 750 x 300/340), since the concentration is proportional to the total amount (reservoir) of carbon. Cockburn’s estimate of the pre-Depression (1929) rate of carbon emissions (the flux) is 1.17 Gt/year. To simplify, let’s assume that all of the CO2 emitted were retained in the atmosphere and all other fluxes were balanced. This would be associated with an annual increase of 0.18 percent (1.17/662 x 100) in the atmospheric CO2 concentration. That’s an expected increase of 0.54 ppm (0.18 percent of 300 ppm) in the CO2 concentration. By 1932 the fossil fuel consumption rate had fallen from 1.17 Gt/year to 0.88 Gt/year. This is a 30 percent drop in the rate at which the CO2 level increases. But it just means that you expect the annual increase in atmospheric CO2 to be 0.13 percent (0.88/662 x 100) instead of 0.18 percent, or 0.39 ppm (0.13 percent of 300 ppm) instead of 0.54 ppm. It is the rate of increase that has fallen, from 0.18 to 0.13 percent or from 0.54 ppm to 0.39 ppm. Thus, the rate of increase has fallen by 0.15 ppm (= 0.54 – 0.39). To recap: If the Depression hadn’t happened, you would expect an annual increase of 0.54 ppm. But since the Depression did happen, you expect an increase of 0.39 ppm. The difference is 0.15 ppm. Is it realistic to expect to be able to detect a change in the concentration of CO2 in the atmosphere from such a small change in the rate of flux over just a few years? The signal of 0.15 ppm should be compared with the year-to-year noise in the data. Looking at the data in the 1980s, where the high-quality post-1958 data from Mauna Loa is available, I examined the year-to-year fluctuations. There are ten years in the series 1980–1989. For each year, I obtained the CO2 concentration in ppm. By subtracting one year from the previous year I obtained the increase from the previous year. These ranged from 1.2 ppm to 2.55 ppm. Then I calculated the change from one year to the next of that increase. I had nine data points (= 10 – 1). Six of the nine data points had year-to-year fluctuations of more than 0.15 ppm, and three data points had less than 0.15 ppm year-to-year fluctuations. So, even in this favorable case, where the Mauna Loa has more reliable data than that which Cockburn cited from the air bubbles in the ice records, you would not expect to detect a change of 0.15 ppm. Furthermore, I simplified the calculation by assuming that all the CO2 from fossil fuel burning was retained in the atmosphere. Today’s climate scientists believe that roughly half of the CO2 injected into the atmosphere by burning fossil fuel is retained in the atmosphere, with the other half dissolving in the ocean (over a period of decades to a century or two). My simplified calculation is, thus, an overestimate, by roughly a factor of two, of the increase expected in the CO2 mixing ratio. In conclusion, the Great Depression argument is not valid. The expected impact of the cutback of CO2 emissions that occurred between 1929 and 1932 is too small relative to the historical buildup of CO2 in the atmosphere to show up in Cockburn’s numbers. Contrarian Claim 2: Water Vapor Is Vastly More Important than CO2 as a Greenhouse Gas. Cockburn thinks18 water vapor is more important than CO2 as a greenhouse gas by a factor of 20. Cockburn did not cite any source for this number. It’s true that CO2 has a smaller greenhouse effect than water vapor, but only by a factor of 2.5 to 4.0 (as shown above), and it is the concentration of CO2 in the atmosphere that has been changing rapidly due to anthropogenic forces. The effect of CO2 is appreciable. The numbers advanced by Cockburn, claiming that CO2 is negligible, are wrong. These numbers circulate among the contrarians. The large absorption in the infrared band caused by CO2 is in and of itself clear evidence of the importance of CO2. Contrarian Claim 3: The rise in CO2 around 10,000 years ago happened after the beginning of the end of the last ice age, not before. Therefore the rise in atmospheric CO2 is a consequence of global warming, not a cause of global warming. Cockburn thinks this is a crushing blow against the claim of anthropogenic global warming. He thinks that there is one factor determining the climate, so if he can prove that increasing temperature caused increased CO2 and not vice-versa at any one time (10,000 years ago), then he has proven it for all times. Many decades ago, numerous scientists also thought that there was one overriding factor determining climate. They no longer think so. Instead, the current scientific thinking is that there are a number of factors that influence climate, including: greenhouse gases in the atmosphere, the reflection of light from the earth’s surface, the exact shape of the earth’s orbit (which varies according to the Milankovitch cycle), and changes in the sun’s intensity. Which factor is more important? That varies from one era to another. (a) The event that initiated the ending of the last ice age was a Milankovitch cycle. Once the process started, increasing CO2 levels caused further warming. (b) During the period 1600–1800, a plausible argument can be made that solar variations caused appreciable temperature changes. (c) The temperature rise during the last half of the twentieth century is caused by the enhanced greenhouse effect, resulting from the burning of fossil fuels. Cockburn lays great stress on the timing issue: 10,000 years ago, the rise in temperature preceded the rise in CO2 levels. This proves (and I agree) that CO2 didn’t cause the beginning of deglaciation (the end of the ice age). But in the last two centuries, the rise in CO2 preceded the rise in temperature. This strongly suggests that the rise in CO2 caused the rise in temperature. The CO2 in the atmosphere has risen since 1800 and especially since 1950, while it was steady for centuries until about 1800. In the modern era, the rise in CO2 came first, then the rise in temperature. Contrarian Claim 4: The rise in atmospheric CO2 comes from the ocean, not from burning fossil fuel. Thus the rise is natural and not anthropogenic. Climate scientists believe that CO2 from the burning of fossil fuels and deforestation enriches the CO2 in the atmosphere. Cockburn believes that most of the increased CO2 in the atmosphere comes from the ocean instead. So where does the CO2 in the atmosphere come from, the burning of fossil fuels, or the ocean? Nature has performed an experiment to decide this question, by putting a label on CO2 molecules, and using one kind of label on CO2 from fossil fuels and deforestation, while putting another kind of label on CO2 from the ocean. We can examine the CO2 molecules in the atmosphere, and the labels will tell us whether the CO2 is coming from burning fossil fuels or from the oceans. The labels are carbon isotopes. Most carbon atoms have an atomic mass of 12, but about one percent have an atomic mass of 13. Carbon-12 atoms can be distinguished from carbon-13 atoms in the laboratory, and both kinds of carbon atoms can form CO2 molecules. So about 1 percent of the CO2 we exhale is 13CO2. The two types of CO2, 13CO2 and 12CO2, behave pretty much the same during most chemical reactions. However, some biological processes show “isotopic fractionation,” in which one isotope is more readily used than the other. For example, in photosynthesis, plants take in CO2 from the air to build up their biomass. Terrestrial plants have a preference to take in 12CO2 instead of 13CO2, so the CO2 in plants is richer in 12C and poorer in 13C than the surrounding atmosphere. In other words, while the abundance of 13C is about one percent of the abundance of 12C, it’s not exactly one percent. The ratio of abundances of 13C to 12C can be slightly higher or slightly lower than one percent depending on the source. Scientists compare the abundance of 13C relative to 12C using the so-called d13C scale. The 13C/12C ratio in a sample is compared to the ratio in a standard material. If the 13C/12C ratio in the sample is exactly the same as the ratio in the standard, then d13C = 0. If the sample is enriched in 13C relative to the standard, the sample is assigned a positive d13C value, while if the sample is depleted in 13C relative to the standard, the sample is assigned a negative d13C value. If the 13C/12C ratio in the sample is higher than the standard by 0.1 percent, then the d13C for that sample is +1. If the 13C/12C ratio in a sample is lower than the standard by 0.2 percent, the d13C for that sample is –2. The d13C values for fossil fuels/biomass, the atmosphere, and the oceans are shown in table 2. Notice that the value of d13C in the atmosphere is in between the level for fossil fuel/biomass and the value for the surface waters of the oceans. If the CO2 in the atmosphere (whose d13C is –8) comes from the surface of the oceans (whose d13C is positive) then the d13C of the atmosphere will increase with time. However, if CO2 in the atmosphere comes from burning fossil fuel (whose d13C is –27), then the d13C of the atmosphere will decrease. The result, from the Mauna Loa observatory, shows the 13C/12C ratio in atmospheric CO2 is decreasing with time.20 These data conclusively demonstrate that the increasing CO2 in the atmosphere comes from burning fossil fuels and deforestation, and not from CO2 released by the oceans to the atmosphere. This conclusion does not depend on the validity of computer models. Cockburn would have a valid point if the ocean surface waters were in fact depleted in 13C. Unfortunately for his argument, the ocean surface waters are enhanced in 13C, while the deep ocean is depleted in 13C. Clearly, Cockburn is wrong on this point. Contrarian Claim 5: A short atmospheric residence time for CO2. How long does CO2 stay in the atmosphere before permanently dissolving in the ocean? This may seem like an unimportant detail, but it turns out to be an important question. If atmospheric CO2 dissolved in the ocean in a short time (a year or two), then cutting back on emissions would promptly lower the atmospheric concentration of CO2. However, if the residence time is long (decades to centuries), then the human race will be stuck with the consequences of global warming for a long time. This was once the subject of an enormous amount of controversy. As recently as the 1950s, many scientists thought that atmospheric CO2 would dissolve almost immediately in the oceans. This was one important reason why many scientists paid little attention to global warming—they thought it was impossible. Estimates of the atmospheric residence time for CO2 ranged from 6 months to 10,000 years. 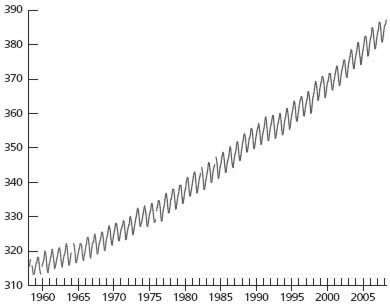 Shortly after C. D. Keeling began his measurement of atmospheric CO2 in 1958, it became clear that atmospheric CO2 was accumulating. This ruled out the short lifetimes: If atmospheric CO2 could dissolve in the ocean in a year or two, it would not be accumulating in the atmosphere. Modern scientists understand that the dissolving of atmospheric CO2 into the oceans is a three-step process: (1) transfer of CO2 across the air-sea interface, (2) chemical interaction of dissolved CO2 with seawater constituents, and (3) transport of CO2 to the deep ocean by vertical mixing. For a long time, many scientists misunderstood the problem. They looked up the solubility of CO2 in water, and there seemed to be nothing to prevent CO2 from dissolving rapidly in the ocean. However, these scientists misconceived the problem. The solubility tells you whether all the atmospheric CO2 can dissolve eventually in the ocean. And all the CO2 can dissolve, but it takes a long time to reach equilibrium. This is the wrong approach. It’s not an equilibrium problem. Instead, it’s a transient problem. The real question is: How long does the system take to reach equilibrium? This was not understood by scientists until the mid-1950s. This is the result of a number of different processes taking place on different time scales. There is not a single time scale for dissolving CO2 in the ocean, but it takes a long time. Because it was once a very contentious area, there were lots of naïve ideas circulating, that are now known to be wrong. Those ideas don’t ever totally die away. Since 1960, many new people have entered the field of climatology, and people with technical backgrounds but little experience in climatology have investigated this issue. People who are new to the field are prone to repeat the same mistakes that climate scientists were making in the 1950s and earlier. Cockburn found one PhD, a retired aerospace engineer, Dr. Jeffrey Glassman, who calculated a lifetime of 1.5 to 2.0 years.24 Judged by his Web site, Glassman’s thinking is based on solubility. As just mentioned, this is a transient problem, not a solubility problem. And, of course, if the lifetime were that short, then the CO2 would not be accumulating in the atmosphere, which it clearly is. Contrarian Claim 6: Believers in anthropogenic global warming are entirely dependent upon large-scale computer modeling, whose validity is suspect. The greenhouse effect is after all a real effect, and a large one. Increasing CO2 in the atmosphere leads to an enhanced greenhouse effect, which will be a little over 1˚C when the CO2 level reaches twice the pre-industrial levels. There is more controversy over the feedback, but an estimate of the feedback based on the recovery from the last ice age (see the section “The Ice Age” above, including endnote 15) yields a prediction that doubling the amount of CO2 over pre-industrial levels will result in a temperature rise of 3˚C, in good agreement with the IPCC estimates of 1.5 to 4.5˚C. Thus the estimates by the IPCC seem quite reasonable. Their results, although based on computer models, are supported by arguments that are independent of computer models. This, of course, should enhance confidence in the validity of the computer models. Anthropogenic global warming is based on very solid science. The discussion in the scientific climate change community is about how much anthropogenic global warming is occurring, but not about whether or not anthropogenic global warming is happening at all. The contrarian arguments raised by Alexander Cockburn lack scientific validity. This is not to say that Cockburn and other skeptics should not have raised some of the questions they have. Science demands constant scrutiny and the misuse of science, when it occurs, is everyone’s concern. But it is also important to recognize a truth when it has been established. The verdict is in. Modern global warming stemming to a considerable extent from anthropogenic causes is real and constitutes a serious threat to life on the planet as we know it. It is time to stop debating its reality and to do something about it, while there is still time. ↩ Alexander Cockburn, “Is Global Warming A Sin?” CounterPunch Web site, April 28/29, 2007. http://www.counterpunch.org/cockburn04282007.html. Print edition of The Nation, May 14, 2007. http://www.thenation.com/doc/20070514/cockburn; Alexander Cockburn, “Who Are the Merchants of Fear?” CounterPunch Web site, May 12, 2007. http://www.counterpunch.org/cockburn05122007.html. Print edition of The Nation, May 28, 2007. http://www.thenation.com/doc/20070528/cockburn; Alexander Cockburn, “Dissidents Against Dogma: Sources and Authorities,” Counterpunch Web site, June 9, 2007. http://www.counterpunch.org/cockburn06092007.html. Published in The Nation, June 25, 2007. http://www.thenation.com/doc/20070625/cockburn. ↩ John Farley, “The Ozone Hole, the Greenhouse Effect, and Global Warming,” University Forum Lecture, University of Nevada, Las Vegas, January 26, 2001. ↩ Alexander Cockburn, “The Greenhousers Strike Back, and Strike Out,” Readers’ letters to The Nation; Cockburn responds. Print edition of The Nation, June 11, 2007. http://www.thenation.com/doc/20070611/cockburn. See also the Web letters to The Nation, http://www.thenation.com/bletters/20070514/cockburn, http://www.thenation.com/bletters/20070528/cockburn, http://www.thenation.com/bletters/20070625/cockburn, http://www.thenation.com/bletters/20070611/cockburn. ↩ This effect was originally called the greenhouse effect because it was believed that this explained the higher temperature of the interior of a greenhouse, compared with the temperature outside a greenhouse. The windows of a greenhouse are transparent in the visible spectrum, and opaque in parts of the infrared. In fact, the main effect that warms real greenhouses is that the windows stop the exchange of air between outside and inside the greenhouse. ↩ The Stefan-Boltzmann law shows the connection of the power radiated by a body with area and temperature and is expressed by the equation P/A = s e T4, where P is the power in Watts, s is the Stefan-Boltzmann constant (5.67 x 10-8 W/(m*K2)2), e is the emissivity (e is about 1 for the earth), A is the area in m2, and T is the temperature in degrees Kelvin. The Stefan-Boltzmann law, found experimentally by Stefan in 1879 and derived theoretically by Boltzmann in 1884, is found in every introductory college physics textbook that covers thermodynamics. This calculation of the temperature that the earth would have in the absence of the greenhouse effect can be found in physics textbooks. The intensity of incoming solar radiation is the so-called solar constant S0 = 1370 W/m2, which gives the maximum solar power falling on a square meter of area when the sun is directly overhead. Averaging over the entire earth, taking into account that half of the earth is in darkness, and the sun is not always directly overhead, it turns out that the average solar power per square meter of the earth’s surface is S0/4, or 343 W/m2, of which a fraction Rp is reflected and a fraction (1–Rp) is absorbed. For the earth Rp is about 0.3. From this we obtain an expression for the average net incoming solar power, 343 (1.0–0.3) = 240 W/m2. The earth radiates heat at long wavelengths, with a power per square meter given by the Stefan-Boltzmann law. Equating the incoming solar power to the earth’s radiating power yields an equilibrium temperature of 255 K, or –18˚C (–1˚F). ↩ Since the majority of the landmass on earth is in the Northern Hemisphere, the bulk of vegetation and, thus, photosynthesis and carbon absorption occurs in the Northern Hemisphere during its spring and summer months. ↩ D. A. Peel, “Antarctic Ice,” New Scientist 98 (1983), 477, cited in Richard P. Wayne, Chemistry of Atmospheres (Oxford: Clarendon Press, 1985), 342. ↩ R. E. Dickinson, in W. C. Clark (ed.) Carbon Dioxide Review (Oxford: Oxford University Press, 1982). Cited in Wayne, Chemistry of Atmospheres, 39. ↩ V. Ramanathan and J. A. Coakley Jr., “Climate Modeling through Radiative-Convective Models,” Reviews of Geophysics and Space Physics 16, no. 4 (1978): 465; Gavin Schmidt (http://www.realclimate.org/index.php?p=142). Gavin Schmidt is a climate modeler at NASA Goddard Space Studies in New York. Schmidt lists the infrared absorption, while this paper lists the change in the infrared absorption, upon removal of the indicated species. ↩ Forcing is expressed as W/m2. ↩ An approximate expression for the climate sensitivity is 1/(4 sT3), where s is the Stefan-Boltzmann constant and T is the equilibrium temperature in degrees K. See John Seinfeld and Spyros Pandis, Atmospheric Chemistry and Physics (New York: Wiley, 1998), 35–36. Numerically, this climate sensitivity is 0.3 K(W/m2)–1, meaning that if the forcing increases by 1 W/m2, the global equilibrium temperature will increase by 0.3˚C. A doubling of CO2 from the pre-industrial levels is estimated to produce a forcing of about 4 W/m2. Multipying 0.3 x 4 yields a temperature rise of about 1.2 to 1.3°C. ↩ See A. Robock, “An Updated Climate Feedback Diagram,” Bulletin American Meterological Society 66 (1985): 786–87, cited in Seinfeld and Pandis, Atmospheric Chemistry and Physics, 1095. ↩ Seinfeld and Pandis, Atmospheric Chemistry and Physics, 37. ↩ Someone who distrusts all models can examine the change in temperature and solar forcing between glaciation (ice age) and interglacial (no ice age) periods. The change in temperature, revealed in ice core samples, is 5˚C, while the change in solar forcing is 7.1 W/m2. The computed climate sensitivity is therefore 5/7.1 = 0.7 K(W/m2)-1. We can use this empirically derived climate sensitivity to predict the temperature rise from a forcing of 4 W/m2, arising from a doubling of the atmospheric CO2 from pre-industrial levels. The result is a predicted temperature increase of 3˚C, which is perfectly consistent with the IPCC predictions of 1.5 to 4.5˚C (Seinfeld and Pandis, Atmospheric Chemistry and Physics, 1102). ↩ J. Lean and D. Rind, “The Sun and Climate,” Consequences 2, no. 1 (1996): 27–36, cited in Seinfeld and Pandis, Atmospheric Chemistry and Physics, 1085. ↩ Wayne, Chemistry of Atmospheres; Seinfeld and Pandis, Atmospheric Chemistry and Physics. ↩ IPCC 2004 report, chapter 2, 138. ↩ Richard E. Zeebe and Dieter Wolf-Gladrow, CO2 in Seawater: Equilibrium, Kinetics, Isotopes (Elsevier, 2001). ↩ Seinfeld and Pandis, Atmospheric Chemistry and Physics, 1089–90. ↩ Cockburn, “Dissidents Against Dogma” Jeffrey Glassman, “The Acquittal of Carbon Dioxide,” http://www.rocketscientistsjournal.com/. Dr. Glassman has a background in electronics, satellites and missiles, but not in ocean chemistry. ↩ Anyone interested in the history of the science behind global warming will benefit from reading Spencer Weart, The Discovery of Global Warming (Cambridge: Harvard University Press, 2003) and his extended essay available at http://www.aip.org/history/climate/index.html.